Free up horsepower and replace your worn out smog pump with Billet Depot's New Billet Series Smog Air Pump Eliminator Kit. This kit features a heavy duty high rpm press fit bearing with double seals, stronger support shaft for better bearing support, lighter pulley, heavy duty hardware and snap ring to avoid failures, that all our competitors smog pumps have, time and time again. Only the Billet Depot Smog Pump Eliminator Kit will keep you on the road or in the race every time. This new kit has the best manufactured components with unmatchable quality and performance and offering the strongest design available anywhere. Includes everything for a fast easy installation with nothing else to buy. Maintains factory belt length and works with all supercharged applications. Free up horsepower and replace your worn out smog pump with Billet Depot's New Billet Series Smog Air Pump Eliminator Kit. 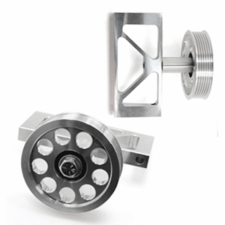 This kit features a heavy duty high rpm press fit bearing with double seals, stronger support shaft for better bearing support, lighter pulley, heavy duty hardware and snap ring to avoid failures, that all our competitors smog pumps have, time and time again. Only the Billet Depot Smog Pump Eliminator Kit will keep you on the road or in the race every time.